Home / Local News / Education / St Giles grads told: Make it happen! St Giles grads told: Make it happen! The St Giles Primary School Class Of 2016 were encouraged to Imagine, Explore, Discover And Ignite Change yesterday at their graduation. Master of ceremonies Shakira Rouse spoke to parents on their role that could have students igniting change. St Giles Primary principal Sandra Anderson delivering her address. Ministry of Education, Science, Technology and Innovation representative Sharon Weekes-Cumberbatch pledged that the ministry, in a national effort to advance and promote development skills like analysis, translation, interpretation, application and evaluation, would continue to evaluate the curriculum. their own livelihoods in a meaningful way and contribute to the development of the society and the nation as a whole,” she said. 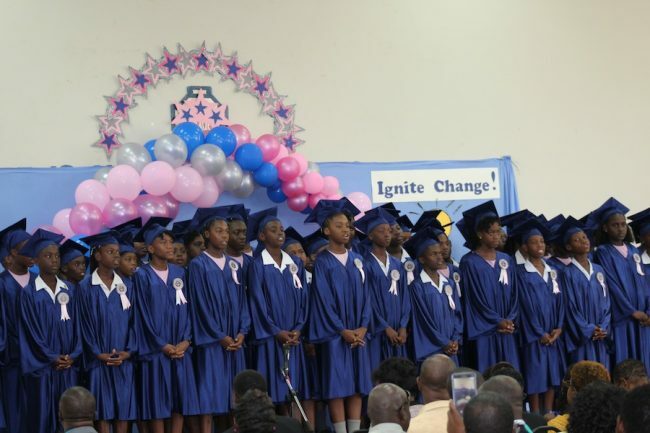 Students of the St Giles graduating Class Of 2016. Pastor Haynes reminded the students of the two most important days of their lives: when they were born and when they discover why they were born. “You cannot give up too early. In life you have ability; you have capability; but you need to have bounce-back-ability. It is also about channelling your energy in the right direction. You don’t want to be working hard and going the wrong way,” he stressed. “I hope you have the desire; I hope you perspire; and I hope you never retire,” the pastor said, before congratulating the Class Of 2016. Of the 65 graduands, Taylia Bretney came out on top. She was the Most Outstanding Female Student and the Most Outstanding Student Overall. Taylia who scored 94 in English and 96 in mathematics with an A in composition is delighted to be attending Harrison College, come September. Top girl Taylia Bretney with mum and dad Tanya and Alvin Bretney. Taylia also received prizes for Most Outstanding In Mathematics and Language Arts, for Excellent Work In Composition [In Class 4 Diamond], Performing Arts, K Kids and Exemplary Conduct. She received prizes too for helpfulness and dedication to prefect duties. Naresh Singh, the Most Outstanding Male Student, who scored 86 in English and 76 in mathematics with an A in composition, will be heading to The Lodge School in September. The delighted boy also received prizes for Most Outstanding In Mathematics and Language Arts, Most Improved In Language Arts and Reading [In Class 4 Emerald]. Top boy Naresh Singh with mum and dad Shelleza and Naresh Singh. Naresh also received prizes for dedication to prefect duties, perseverance and exemplary conduct, and a K Kids Award.